“When people think of obsessive-compulsive disorder (OCD), they tend to think of the box office hit “As Good As it Gets” with Jack Nicholson, or the more recent US television sitcom “Monk”. These popular culture depictions of OCD do tend to correctly portray the “bizarre”, “senseless” and sometimes even “laughable” nature of the disorder. What they do not accurately represent is the often extremely intense emotional distress, functional impairment and debilitation that typify this condition for many children, teenagers and adults. Whilst television viewers might describe “Monk” as eccentric, or as having a quirky character, real sufferers of OCD tend to be very normal, sensible people, who are, however, frequently completely crippled by fear ayid anxiety, due to this neurobehavioural disorder. OCD is a severe form of anxiety affecting approximately 3-4% of children and adults. It is characterized by the experience of obsessions (uncontrollable, intrusive, “scary” thoughts) and compulsions (repetitive behaviours of a ritual nature). Sufferers may develop compulsions in an effort to “neutralize” the thoughts and therefore prevent something terrible from happening. 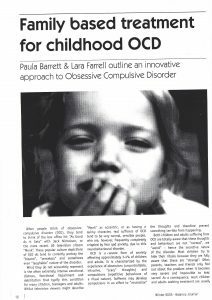 Both children and adults suffering from OCD are totally aware that these thoughts and behaviours are not “normal”, are “weird” — hence the secretive nature of the disorder. Most children try to hide their rituals because they are fully aware that these are “strange”. Often parents, teachers and friends only find out about the problem when it becomes very severe and impossible to keep secret! As a consequence, most children and adults seeking treatment are usually experiencing debilitating levels of OCD by the time they seek help. We don’t know exactly why some children develop OCD and others don’t. 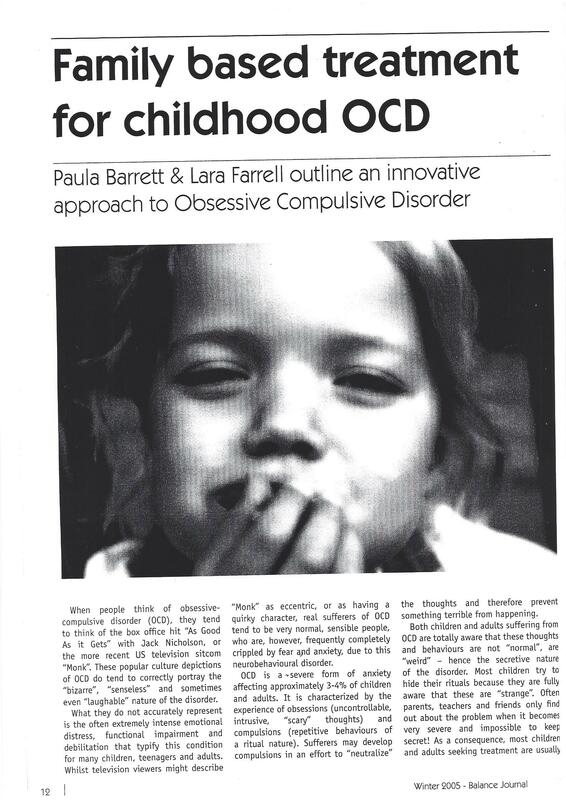 We know for certain that parents do not cause OCD in children. Research suggests there is a biological component to OCD. Children from families with a history of the condition or other anxiety problems are more likely to have OCD. But since many people hide their OCD and never receive treatment, it may be difficult to trace a family member with OCD. Some children may have a genetic predisposition but may never end up having OCD, and similarly children can develop OCD without having a genetic predisposition. 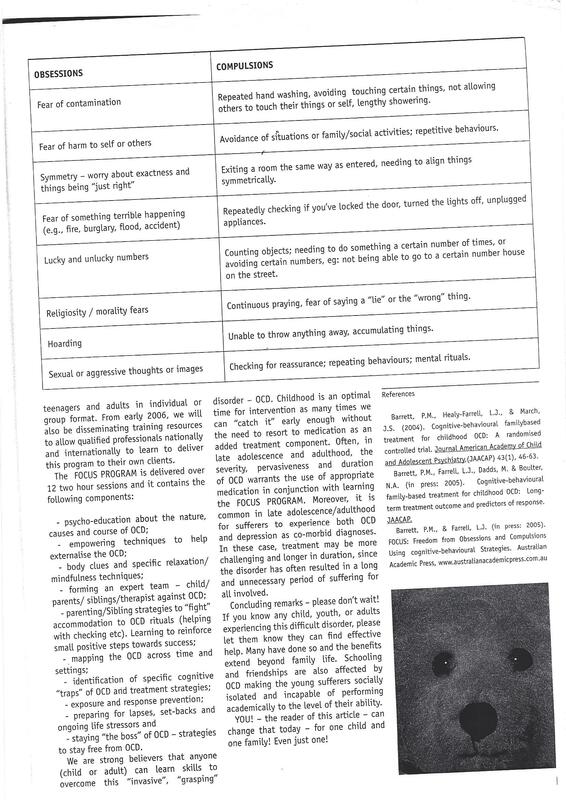 The development of OCD is based on the complex interaction between biological vulnerability and life circumstances. Stress plays an important role. There may be increased stress in a child’s life or their family environment. This can have a negative effect and contribute to the development of OCD. OCD also often becomes more severe during times of stress, or when a child is tired, run down or unwell. OCD is most often described as a neurobehavioural condition. We know from neurological research that brain chemistry (i.e., serotonin levels), and specific areas in the brain associated with processing information, are implicated in the development and/or maintenance of this disorder. Research from the University of California (Los Angeles) using PET scan imaging has shown that sufferers with OCD have increased chemical activity in certain regions of the brain compared with controls who do not have OCD. Interestingly, this brain chemistry and reactivity appears to return to normal following cognitive-behavioural treatment – highlighting the fact that we know our brains are malleable! We can change our brain chemistry, by simply changing our thinking patterns and behaviours! 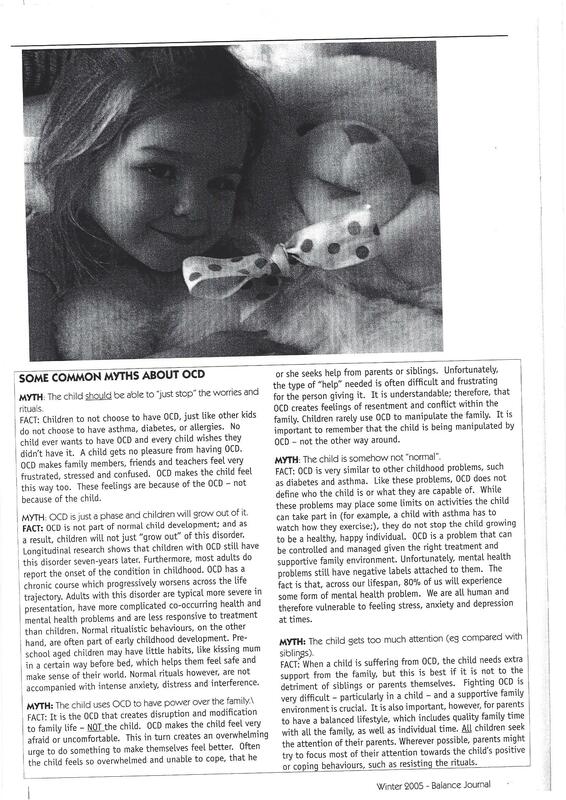 It is important to realize that children do not choose to have OCD, just like other kids do not choose to have asthma, diabetes or allergies. 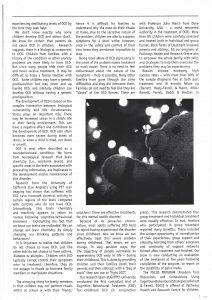 Children with OCD typically cannot control their symptoms prior to treatment; therefore, they do not engage in rituals to frustrate family members or manipulate situations. The annoying thing for family members is that children may not perform rituals whilst at school or with their friends; hence it is difficult for families to understand why the must do their rituals at home. Due to the secretive nature of the problem, children are able to suppress symptoms for a short while; however, once in the safety and comfort of their own home they are-almost impossible to stop. Being more aware of OCD signs early in the onset of the problem makes treatment so much easier. There is no need to feel embarrassed about the nature of the symptoms – help is possible. Many other families have gone through the same difficulties and they did overcome them. Families do not need to feel like they are “slaves” of the OCD forever. There are solutions! There are effective treatments for this mental health disorder! Because of its pervasive, chronic nature, most adults suffering OCD tend to report having experienced the disorder since childhood. Now we know we can effectively treat this severe problem during childhood. That means we can change, in very positive ways, the life trajectory of people vulnerable to experiencing OCD early in life – during their childhood. This is done by providing children and their families (both their parents and their siblings) with a “bag of tools” they can use to “fight OCD”. Our research team at Griffith University conducted the first controlled trial of Cognitive Behavioural Treatment (CBT) for childhood OCD (in conjunction with Professor John March from Duke University, USA – a world renowned authority in the treatment of OCD). More than 80 children were carefully assessed and treated both in individual and group format. 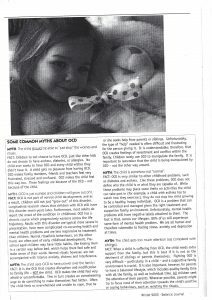 Both forms of treatment involved parents and siblings. All our programs at Pathways Health and Research Centre aim to empower the whole family with skills and strategies to help them overcome the problems they may be experiencing. Results showed extremely high success rates – with more than 80% of the sample diagnosis free at both post treatment and 18 months follow up (Barrett, Healy-Farrell, & March, 2004; Barrett, Farrell, Dadds & Boulter, in press). This research demonstrated that group treatment and individual treatment were equally effective. 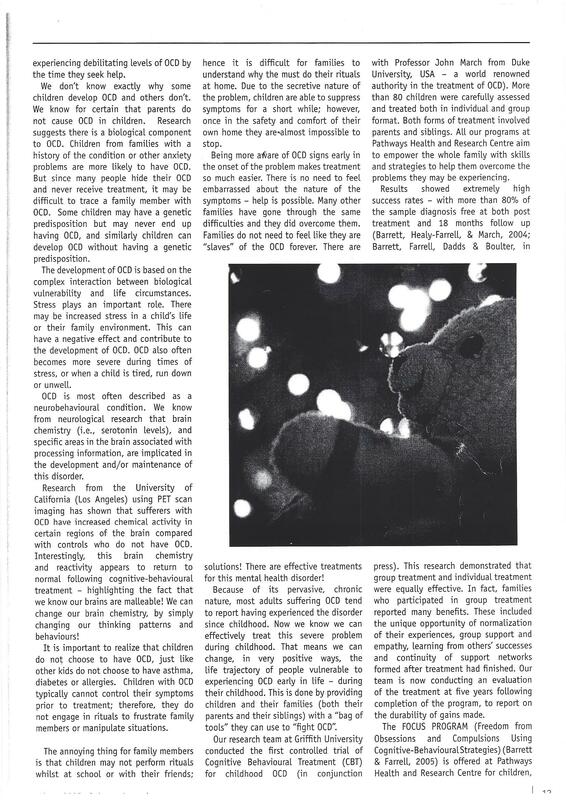 In fact, families who participated in group treatment reported many benefits. These included the unique opportunity of normalization of their experiences, group support and empathy, learning from others’ successes and continuity of support networks formed after treatment had finished. Our team is now conducting an evaluation of the treatment at five years following completion of the program, to report on the durability of gains made. The FOCUS PROGRAM (Freedom from Obsessions and Compulsions Using Cognitive-BehaviouralStrategies) (Barrett & Farrell, 2005) is offered at Pathways Health and Research Centre for children, teenagers and adults in individual or group format. From early 2006, we will also be disseminating training resources to allow qualified professionals nationally and internationally to learn to deliver this program to their own clients. – staying “the boss” of OCD — strategies to stay free from OCD. We are strong believers that anyone (child or adult) can learn skills to overcome this “invasive”, “grasping” disorder — OCD. Childhood is an optimal time for intervention as many times we can “catch it” early enough without the need to resort to medication as an added treatment component. Often, in late adolescence and adulthood, the severity, pervasiveness and duration of OCD warrants the use of appropriate medication in conjunction with learning the FOCUS PROGRAM. Moreover, it is common in late adolescence/adulthood for sufferers to experience both OCD and depression as co-morbid diagnoses. In these case, treatment may be more challenging and longer in duration, since the disorder has often resulted in a long and unnecessary period of suffering for all involved. Concluding remarks — please don’t wait! If you know any child, youth, or adults experiencing this difficult disorder, please let them know they can find effective help. Many have done so and the benefits extend beyond family life. 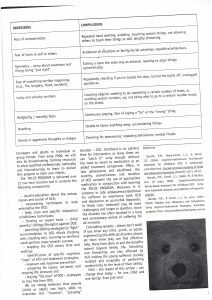 Schooling and friendships are also affected by OCD making the young sufferers socially isolated and incapable of performing academically to the level of their ability.